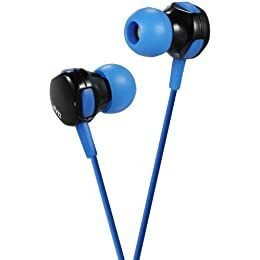 JVC FX16 Inner-Ear HeadphonesWith a 2-way listening style, normal or over-ear wearing the FX16 in-ear headphones from JVC are the perfect option to listen to your music. Superior noise isolation and rubber support ensure that you not only have a comfortable fit but get the best in audio sound quality.The detachable loop for over-ear wearing style and multiple silicone ear pieces means that you can enjoy your music the way you want. The FX16 also come with a 1.2 metre cord for convenience and a 3.55 gold plated jack for compatibility with most mobile and smarpthone devices.Optimised for MP3, iPod, iPhone, CD players and portable gaming systems, if you love great sound whilst listening to music, then these JVC headphones are for you. Look cool with the stylish JVC FX16 in-ear headphones. Avoid using headphones with the volume turned up for an extended period of time. Doing so can damage your hearing. It is advisable to keep the volume at a moderate level at all times. For your own safety, please do not use when driving or cycling.